COLUMBIA, S.C. (AP) South Carolina linebacker T.J. Brunson believes the Gamecocks have their minds right in prepping for their most important Southeastern Conference game in four years. The Gamecocks (6-2, 4-2 SEC) have won three straight league games for the first time since 2013 after defeating Vanderbilt 34-27. The Gamecocks face their most impactful game since then on Saturday when they take on powerhouse No. 2 Georgia (8-0, 5-0) with the SEC Eastern Division title still in play. ”We’ve worked hard and this would be a statement about who we are,” Brunson, the team’s top tackler, said Tuesday. It would certainly be a shocker, too. The Gamecocks have struggled the previous few years after being one of the East’s top teams from 2010 to 2013 under former coach Steve Spurrier. South Carolina reached it’s only the SEC title game in 2010, then were in the thick of the race the next three seasons as they finished 11-2 each time. But things went sideways for the Gamecocks after that. Spurrier walked away in the middle of a disastrous 3-9 season in 2015 and new coach Will Muschamp went just 6-7 last year . Now, he’s got the Gamecocks grinding back toward the top. Not that it’s an easy path, even with what certainly would be one of the season’s biggest surprises in Athens, Georgia this weekend. The Bulldogs have a two-game lead on South Carolina and Kentucky. A Georgia win Saturday would eliminate the Gamecocks from the race. Georgia would lock up its spot in the championship game with one more win in its final two league games with Auburn and Kentucky. Georgia receiver Terry Godwin thinks his team has grown in its poise and is focused on this week, not about what’s down the road. Muschamp said players understand what’s on the line so it’s the consistency in preparation that will carry them through any outside distractions or pre-game hype about what this game could mean. ”Our meetings aren’t any longer. There’s no more (extra) emphasis on what we’re trying to do,” he said. That methodical approach has so far led South Carolina to qualify for a second straight bowl game. Muschamp joined Spurrier as the only Gamecocks coaches to make the postseason in their first two seasons as coach. Still, South Carolina players are seeking more. Defensive end D.J. Wonnum said the players have not talked much among themselves about the possibilities that open up if they beat Georgia. Their focus in on this week, and doing what is necessary to prepare for the Bulldogs. 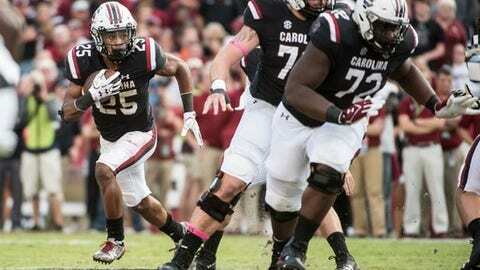 South Carolina tailback A.J. Turner said the team has steadily improved from week to week and have a confidence about what they can accomplish, no matter how highly regarded the opponent.